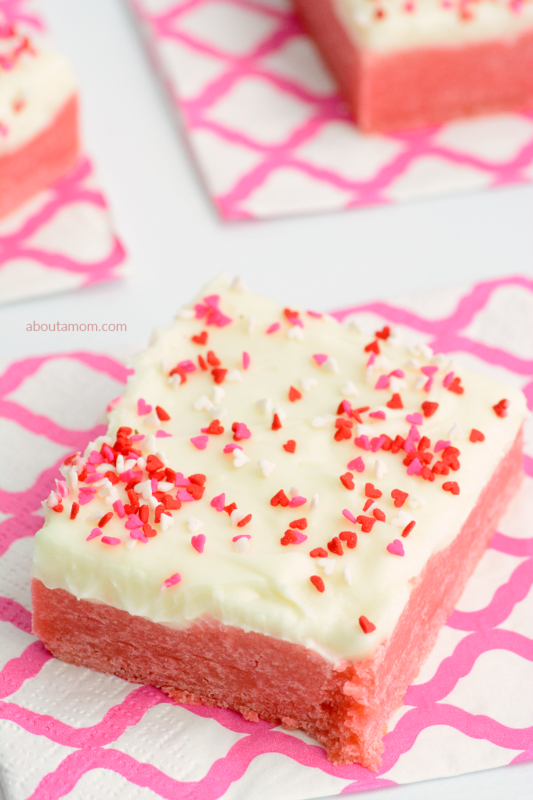 These lovely Valentine Sugar Cookie Bars are super delish, and the perfect sweet treat for the one’s you love this Valentine’s Day. 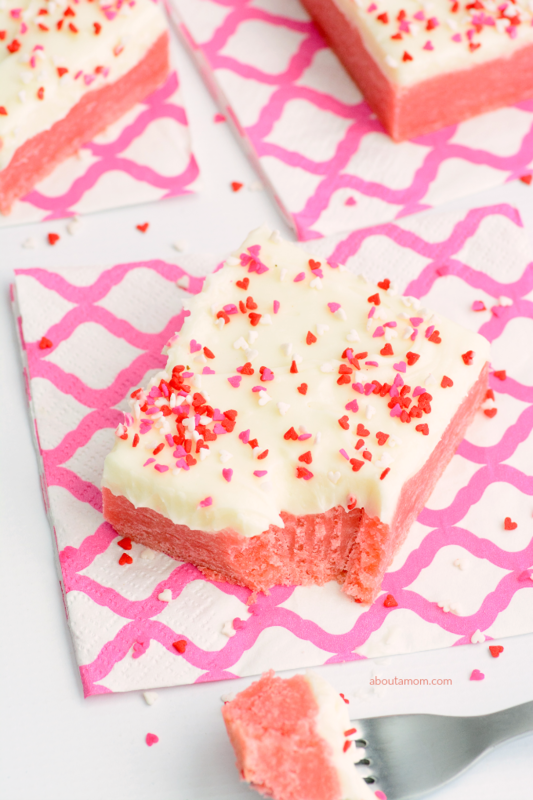 Tender sugar cookie bars are tinted pin and frosted with a yummy cream cheese frosting. Add a festive touch with some pink and red sprinkles. 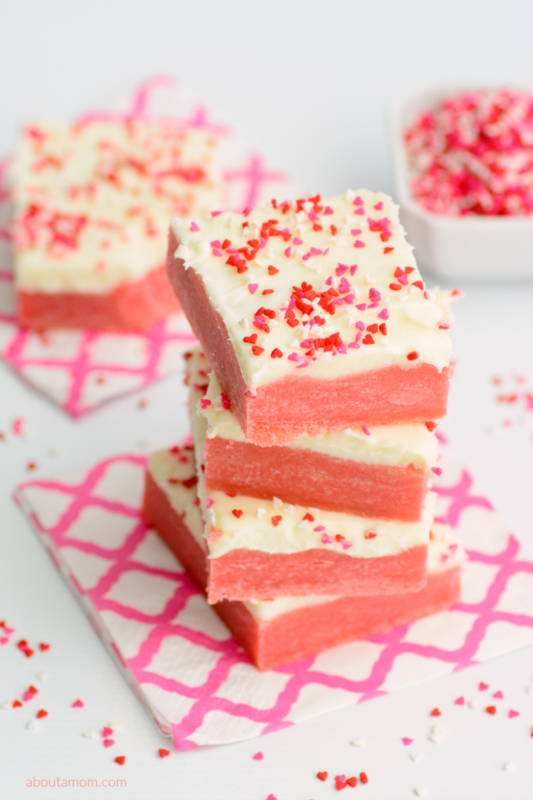 Sugar cookie bars are fast becoming my favorite sweet treat. 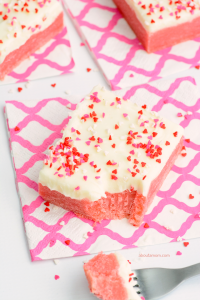 This Valentine’s Day recipe rivals the Peppermint Sugar Cookie Bars recipe we shared for the holiday season. In a mixing bowl, cream together 1 cup butter and sugar until light and fluffy. About 2-3 minutes. Beat in the eggs, vanilla, and food coloring until well combined. Add the flour mixture until a soft dough forms. Dough will be very thick. Press into the bottom of a 9×13 inch baking dish. Bake for 20 minutes until or until a toothpick entered into the center comes out clean. To make the cream cheese frosting, beat together the cream cheese and butter. Add the powdered sugar and vanilla. Beat together until smooth. Frost the top of the bars and sprinkle with your favorite sprinkles. Enjoy! In a mixing bowl, cream together 1 cup butter and sugar until light and fluffy. About 2-3 minutes. Beat in the eggs, vanilla, and food coloring until well combined. Add the flour mixture until a soft dough forms. Dough will be very thick. Press into the bottom of a 9x13 inch baking dish. these look so yummy and we love that they are pink! Perfect for Valentine’s Day!!! These sound delicious. Thank you for the recipe! I will pin it. These are almost too pretty to eat, but I would eat them for sure! Looks good! What a nice and simple recipe. Kids or grownups would enjoy this Valentine’s Day treat! Cookies with cream cheese frosting… you speak my language! Thanks for sharing at the Delicious Dishes Linky Party! i would suggest a bigger pan to bake them in as there is a lot of dough and in an 8×8, it’s quite thick in the middle. they were in the over for about an hour and still not baked through, i’m talking raw in the middle! 8×8 was a typo. In the instructions it says use a 9×13 which makes a lot more sense. Did you miss the 9×13 part? I wish I had seen these before valentines day. I guess I could bookmark them and make them for his birthday. These would be perfect for a girl’s party or even to bring to make for a shower! I love all these flavors, and they are so pretty, too, I’d like to try them.